It seems the paper, which last month published an article (a little after the SKWAWKBOX!) highlighting the fallacious nature of the media claims of 13,000 ‘needless’ deaths in just 14 hospitals, has finally twigged that if the mortality claims were wrong about those 14 hospitals, the claims about deaths at Stafford hospital are just as false for exactly the same reasons. It’s about time. And – as someone commented on Facebook in a humorous but sadly accurate commentary on the state of the UK’s media and the resulting skewed priorities of many people – since the correction was just before a correction about the new Dr Who, it might just get a wide readership! It would be nice to think that the Guardian is just the first of many papers to correct such a blatantly misleading statement. However, I wouldn’t hold your breath if I were you. The right-wing rags and the suborned BBC will continue to propagate the ‘needless deaths’ falsehood for as long as it’s considered politically convenient by a government trying simultaneously to undermine public affection for the NHS and to dislodge Labour from its position as the only party that can be trusted with the future of our health service. I’ve sent this as part of my continuing complaint to the BBC about bias and factual inaccuracy. 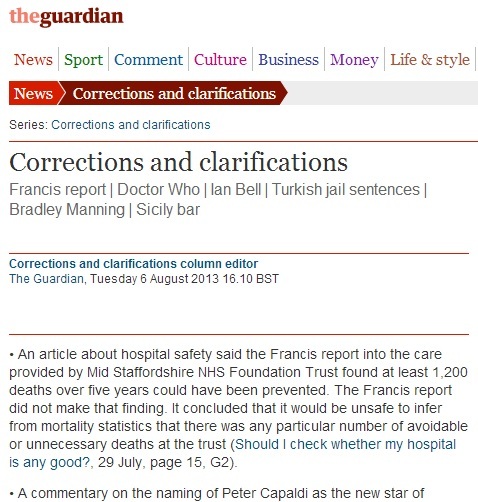 I said ‘if the Guardian is prepared to admit it is wrong, so should you’. Deborah have you received a reply from the BBC because I never got one? Good news! But sadly, the damage has been done, and the world has moved on. Few people read corrigenda. The politicians know that it’s the headlines that bite, and the GPB isn’t interested in detail or depth, and they exploit that shamefully. Nevertheless, brilliant achievement, and keep up good work! A more detailed explanation in the Guardian today (http://www.theguardian.com/society/2013/aug/07/nhs-health), based on article in the BMJ (http://www.bmj.com/content/347/bmj.f4893) by Dr David Spiegelhalter. FINALLY commentary from someone who understands stats better than I do. I’ll try to remember to email her programme in the morning! The Guardian should have placed this story on the front page, with a huge headline about it being a myth, that way the narcissistic “opinion minions” who the BBC and Sky News get in to review the front pages would have found it difficult to avoid, thus getting at least some TV News coverage. Exactly my thoughts, Matt. Nobody notices corrections, burried on page n somewhere. It’s almost as if they are embarassed to print the truth if they won’t give it the same coverage as the original article. It’s not as if this was a mere typo. Well it seems they all want to talk about the Struggling A&E departments which are to be given a £500 million Government bailout .. they don’t want to spend time correcting previous unfounded claims, or indeed explore why we now have an A&E crisis .. or go into depth why £15 million of that £500 million is being pumped into the (NHS) 111 service? Does that mean Care UK owned Harmoni will be getting a cash “infusion” to make up for its part in providing a crappy service on the cheap which is helping to send an extra 250,000 patients to A&E for things like period pain, cat scratches and hangovers? Great points – and sadly, the answer is probably yes.